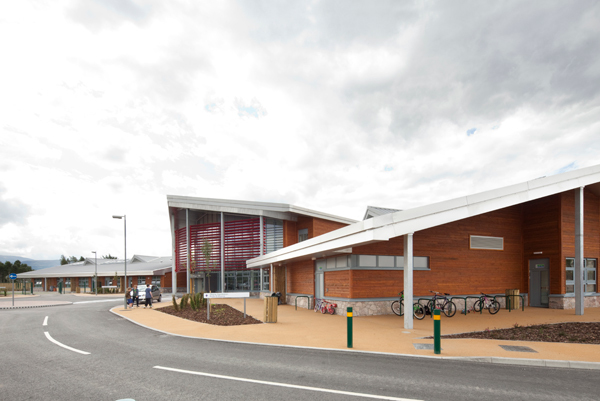 The new school facilities includes ten primary classrooms, two general purpose classrooms, a resources area, a main hall, a wraparound nursery unit and childcare facilities with independent access, assisted support needs facilities, multipurpose sports hall, kitchen and dining facilities, support for learning unit, biomass boiler and a fenced sports pitch. The majority of the lighting within the building is automated and controlled via a PC within the onsite FM office. 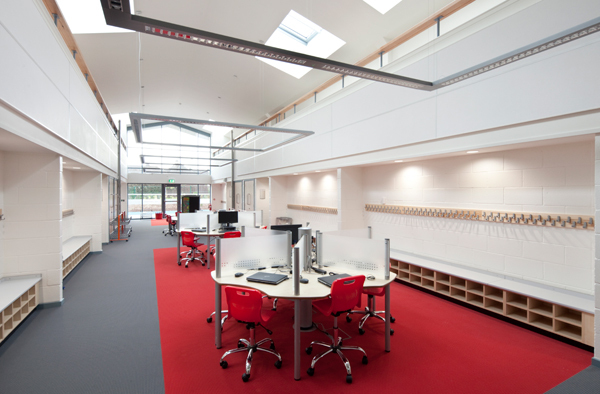 The system monitors both daylight levels within classrooms and emergency lighting for faults, routinely undertaking emergency lighting tests throughout the building, thereby negating the need for manual testing. Fire alarm coverage within the plant spaces could not be provided using normal detection due to the inaccessible peaks within these areas so Air sampling pipework was installed at high level back to vesda units at low levels which negates the need for maintenance or requiring access to above ductwork etc. in the plant areas. Extreme weather which is regular in the region played a large part in the design & set out of any external equipment with temperatures dropping below -16 degrees in winter with large snow fall, all external equipment had to be suitably mounted & positioned to deal with the high winds & build-up of snow at roof level affecting sensing equipment for the BEMS/ lighting control & TV/satellite equipment. 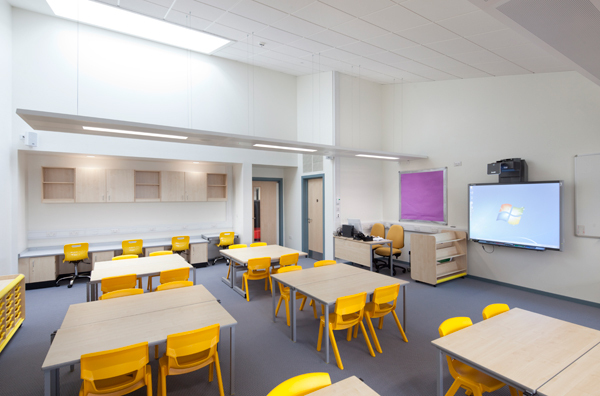 All classrooms were fitted out with motorized interactive whiteboards with integral projectors which were also installed as part of our works. 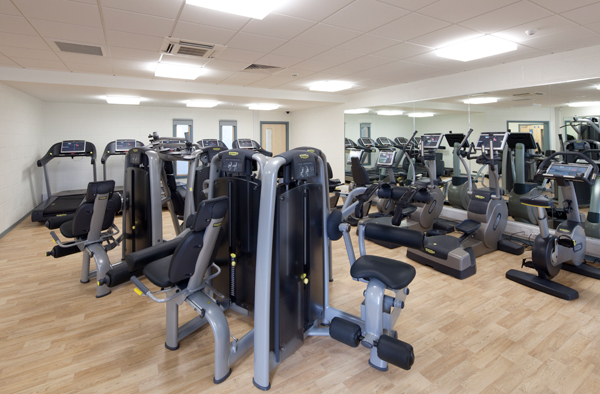 Three comms rooms were installed due to the shape & size of the building in order to reduce structured cabling runs to below the required 90mtrs; the cabinets within these rooms were linked together with both copper & fibre links to provide full connectivity between cabinets. The LTHW system comprises of two Catfire pellet burning biomass boilers rated at 250kw each. The boilers are fed with from a 22m3 galvanised silo/storage vessel complete with automated auger motorised delivery system. 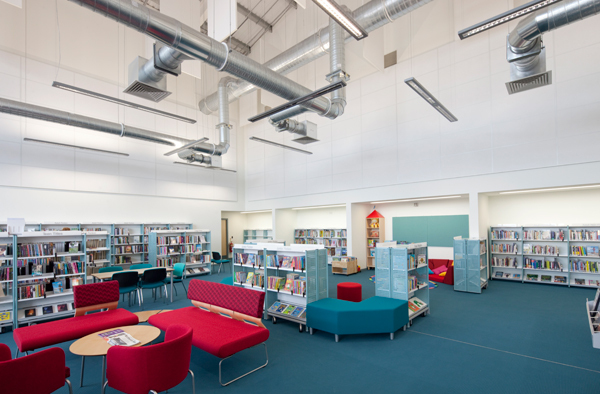 The ventilation system comprises of 6 air handling supply and extract units situated in the mezzanine plant area in block a with distribution ductwork to the various areas.